Stefano Garzelli (Acqua & Sapone) powers to a stage victory on the Plan de Corones. Belarus time trial champion Branislau Samoilau (Quick Step) finished 11th. King for a day: Stefano Garzelli celebrates his Plan de Corones time trial victory. 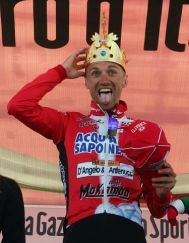 Stefano Garzelli (Acqua & Sapone) celebrates his stage win on the Plan de Corones. Stefano Garzelli's stage win is his first at the Giro since 2007. Giro leader David Arroyo (Caisse d'Epargne) is congratulated by compatriot and F1 star Fernando Alonso. Spain's Giro leader David Arroyo (Caisse d'Epargne) and F1 driver Fernando Alonso on the podium. The Irish flag is flying for Dan Martin (Garmin - Transitions) on the Plan de Corones. Formula 1 star Fernando Alonso arrives at the summit via motorcycle. David Arroyo (Caisse d'Epargne) remains in the pink jersey after the Plan de Corones time trial. Best young rider Richie Porte put in another strong ride. Stefano Garzelli (Acqua & Sapone) during his stage-winning performance on Plan de Corones. Ivan Basso (Liquigas-Doimo) en route to sixth on Plan de Corones. Linus Gerdemann (Milram) suffered from bronchitis, hampering his Plan de Corones TT. Bradley Wiggins (Sky) finished almost five minutes behind the stage winner. Gilberto Simoni (Lampre) put in a respectable performance in 30th. Michele Scarponi (Androni Giocattoli) suffers his way to the top. David Arroyo looks for the finish line. Alexander Vinokourov (Astana) suffers up the Plan de Corones. A mechanic runs alongside the pink jersey holder David Arroyo just in case of a flat. Cadel Evans (BMC), leader of the points classification, gives it his all on the Plan de Corones. Vincenzo Nibali (Liquigas - Doimo) is encouraged by the tifosi on the Plan de Corones. Ivan Basso (Liquigas) lost a bit of time on Evans but is now second on GC. Michele Scarponi (Androni Giocattoli) put his climbing skills to work on the Plan de Corones. Can you spot Ivan Basso? Ivan Basso (Liquigas - Doimo) grits his teeth on the upper slopes of the Plan de Corones. Ivan Basso (Liquigas - Doimo) moved into 2nd overall and narrowed the gap to race leader David Arroyo. Richie Porte (Saxo Bank), leader of the best young rider classification, has been a revelation in this Giro edition. David Arroyo Duran (Caisse d'Epargne) lost time to the favourites, but remains in pink for another day. Best young rider Richie Porte (Saxo Bank) finished in the top 20 today and extended his lead in the classification. Ivan Basso (Liquigas - Doimo) finished 6th on Plan de Corones and moved into 2nd overall. Carlos Sastre (Cervelo TestTeam) climbs to a 19th place finish. Points classification leader Cadel Evans (BMC) put time into all his GC rivals with a 2nd place finish. Alexandre Vinokourov (Astana) labors on the steep slopes of the Plan de Corones. Michele Scarponi (Androni Giocattoli) nears the finish. Vincenzo Nibali (Liquigas - Doimo) put in a solid 4th place performance. Italian time trial champion Marco Pinotti (HTC - Columbia) in action on the Plan de Corones. David Arroyo (Caisse d'Epargne) finished 16th on the Plan de Corones and remains in the race lead. Cadel Evans makes his way through the crowd. John Gadret (Ag2R - La Mondiale) put in a strong performance on the Plan de Corones. Damiano Cunego (Lampre - Farnese Vini) finished 14th on the Plan de Corones. Riders make their way up to the finish of the Giro's Plan de Corones TT. Jackson Rodriguez (Androni Giocattoli) sees 500m to go. The tifosi help a Colnago_CSF Inox rider make it to the top. It wouldn't be a Giro stage without the big chicken. Get me off this torture device! The top of the Kronplatz couldn't come soon enough for some riders. Former Giro winner GIlberto Simoni (Lampre - Farnese Vini) nears the finish. Greg Henderson (Sky) in action on the Plan de Corones. It may be a decade since Stefano Garzelli won the Giro d'Italia but atop the Plan de Corones this afternoon he turned back the clock to take an intriguing 16th stage that scaled the feared slopes and netted the Italian veteran the title: King of Corones. The 36-year-old Varesine last tasted Giro success in 2007, winning two stages en route to finishing 16th overall, and as he started today's vital test against the clock more than 30 minutes in arrears of the general classification leaders, it was a brave soul willing to bet on him for honours at day's end. But that's what he did, mastering the gravelled slopes that last hosted a stage of the Giro just two years ago (when Franco Pellizotti prevailed) and in so doing capping what could be his last appearance at the race in fine style, regardless of what happens in the following five days. "I normally go well in time trials when they contain hills. I had a great ride in the Cinque Terre last year and I also usually go well the day after the rest day," said Garzelli. "I got my best result at the Tour de France with a third place at L'Alpe d’Huez in 2006. But I didn't expect to win today. This is one of my nicest victories. I had times of reference, so I knew what to do in that climb." For all the sentimental value attached to Garzelli's win, however, the battle that intrigued journalists, fans and the riders themselves was being waged between Ivan Basso and Cadel Evans, the Italian proving the strongest on the slopes of Monte Zoncolan last Sunday, where he moved himself into serious overall contention with a stunning performance. He was up against the grinta of Evans however, the current road race world champion demonstrating his skill against the clock by taking back 28 seconds on his esteemed opponent, who, like the Australian, is trained by respected Italian cycling stalwart Aldo Sassi. "I went my own pace," said Evans afterwards. "The stage was hard and a bit dangerous at times because of the crowds. But I was feeling good with my experience in mountain biking." In the opinions of many watching today's proceedings it was essentially the battle for the maglia rosa, or at least a litmus test for expectations throughout the final week of racing, the settimana tanta dura set to provide more brilliant racing and test the resolve of those with aspirations of overall victory. And despite the surprises of Garzelli's victory and John Gadret's fantastic third place finish on the stage, one aspect became crystal clear: both Evans and Basso have the form and mental toughness to battle this title fight through to the final chapter, the last day in Verona, where yet another time trial will pit the two against each other, with the Giro's trophy the reward at day's end. This was reflected in Evans' comments after the stage: "There's still a ways to go. It's still an open Giro," he said. While today's chronoscalato didn't tell us who will prevail at race's end, it did provide an indication as to who's hot and ready for a fight over the next five days. The key to performing well in today's stage was consistency; as riders faced 12.9km of climbing at an average gradient of 8.2 percent that maxed out at a ridiculously steep 24 percent, the man who could best manage his effort and retain a consistent pace would go far. And that's not factoring in the effects of gravel roads, riders forced to try and maintain traction on the strade bianche section of the Plan de Corones, as though it wasn't difficult enough already. Garzelli was the man to achieve that, smashing the hitherto best time of 43:04, set by Caisse d'Epargne's Riberto Uran. It was then a waiting game for the Acqua e Sapone rider, whose masculine features have netted him top billing on Dolce and Gabbana advertisements in the past and ultimately the face that would smile under the crown awarded to the King of Corones. "I took it easy when it wasn't steep and I sprinted when it was hard," Garzelli said. "For the gravelled road the smallest possible gear: 34x29. When I saw my time at the finish, one minute behind Pellizotti's two years ago, I thought I had done really well. Maybe the GC contenders have started too strong on the Passo Furcia." But before the celebrations could commence for a job well done, it was time for some machinations from those general classification contenders. Today's stage was labelled as an important step in the makeup of the final podium and it didn't disappoint, serving up an interesting treat for fans. While first and second place on general classification at the start of the day, David Arroyo and Richie Porte respectively, were expected to struggle on the difficult parcours, all eyes were on Basso, Evans, Michele Scarponi and Carlos Sastre, the quartet of contenders carrying the weight of leadership in this challenge up Corones' brutal slopes. Basso trailed the Caisse d'Epargne rider by 3:33, Sastre by 4:21, Evans by 4:43 and Scarponi by 6:34. By day's end the big winners were the aforementioned two men to watch: Basso and Evans, who moved into second and fourth respectively, plus Garzelli, who weathered the storm to win the stage by a whopping 42 seconds, and to a lesser degree Porte, who survived yet another tough test to remain the Giro's best young rider. As for Arroyo, he netted himself 16th on the stage but more importantly stays in the maglia rosa for another day. "I'm happy, I thought I would lose more time. I've got through an important day today," he said. "I'm not sure if I can win the Giro but the important thing is I've still got the pink jersey and I'll fight day-by-day to keep it. Hopefully we can carry on like this. If so, I could finish on the podium. "I've got a lot of faith in my team. They know what they've got to do. And they always ride for me." The surprise of the day was undoubtedly Gadret, Ag2R-La Mondiale's diminutive cyclo-cross expert pulling out a sensational time of 42:22, bettered only by Garzelli and Evans. Vincenzo Nibali also maintained pressure on the front runners with a 42:29 - good enough for fourth - which keeps him in sixth place, just 17 seconds off Sastre. Tomorrow's stage ain't a ride in the park, for those thinking of a rest after today's efforts; the Passo delle Palade is the highlight of the parcours while the 173km stage finishes with a climb to Peio Terme. Look for Liquigas on the front of the peloton, keeping the pace high and protecting Basso's chances while a plucky break may aim for a brave, if unlikely, stage win.